Earlier this week, Boston Police Commissioner Edward F. Davis released a flier throughout various communities in the City of Boston showing photos of 10 unidentified young men the police allege belong to a street gang. I’m not going to qualify the flier by posting it on this Blog, but it looks like a mug shot composite. The purpose in releasing the photos of these men, they police say, is to “shame them” for being gang members and to make them “outcasts” in their neighborhood. 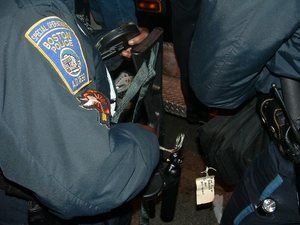 Although the Boston Police Commissioner then qualified the Department’s objectives by clarifying that the men depicted in the photographs were not currently facing any criminal charges or had outstanding warrants, he stated that they were “absolutely high on [the Boston Police Department’s] list of targets”. Well, if they haven’t committed a crime and they’re not currently wanted for a crime, then tell us: why are they a high priority target??? The objective, apparently, is to receive information from the public on these men and charge them with whatever criminal activity gained from any tips. Interestingly enough, I represented two of the men depicted in the photograph released by the Boston Police Department. One of the men had no prior criminal history and pled guilty to Assault & Battery with a Dangerous Weapon and Intimidation of a Witness; the other was charged with Armed Robbery and was found Not Guilty after trial (and this man had no prior criminal convictions). …hardly the bios of reputed gang members who are high on the Boston Police target list. Having met these 2 kids and gotten to know them over the course of a year, I find it unbelievable that these two are among the top ten most reputed gang members in the City of Boston. And one might wonder, well, how does the Boston Police Department know that these individuals are, in fact, gang members? I would submit that they really don’t. That is a question myself and other criminal defense lawyers have repeatedly asked in almost every case where the issue arises. Often, I never receive a straight answer other than “internal intelligence”. When I do receive any answer of purported substance, it usually comes in the form of “the defendant has been observed hanging out on X Street…” Believe it or not, ‘hanging out’ might mean literally sitting on the steps outside of his residence! Whatever happened to the fundamental canon of our Constitution, presumed innocent until proven guilty? Doesn’t this shame campaign give the improper suggestion that these individuals are criminals? This is particularly disheartening where, in fact, the police readily admit they are not charged with any crimes, let alone the targets of any pending criminal investigation? What are then the limits of such campaigns? Should the police then target all the residents of a community as ‘prone to criminal activity’? Already, police love to describe certain sections of Boston as ‘high crime areas’ – meaning that if you live in such a ‘high crime area’, that will serve as a factor justifying your being stopped and arrested for a crime. Boston Criminal Lawyer Lefteris K. Travayiakis welcomes your comments to this post and can be reached via e-mail.